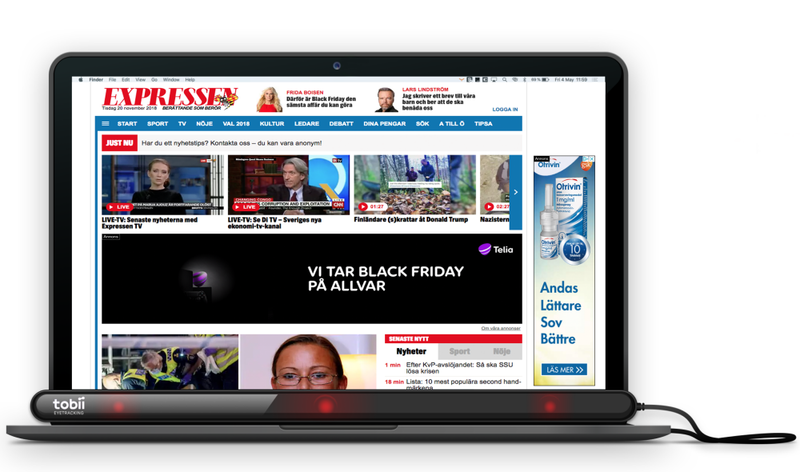 Tobii Pro Pulse delivers ad attention data collected from a Swedish large-scale in-home panel equipped with eye tracking technology. This gives you unique knowledge to increase the effectiveness of your online advertising. Up until now digital ad performance metrics have been centered around impressions and viewability* - how many people potentially saw an ad. But just because an ad is in front of someone doesn't mean they actually look at it. 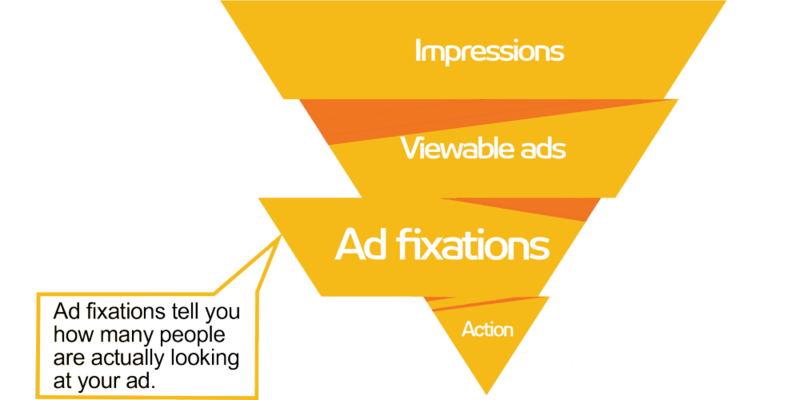 'Ad fixation' is a measurement of how many people visually fixate on a viewable ad. This powerful knowledge allows you to develop a truly successful online media buying strategy based on consumer behavior. * IAB considers a display ad to be 'viewable' if at least 50% of it appears in-screen for more than one second. We can tell you how well your message is getting through compared to your competitors'. The graph compares 5 brands in the telecom sector. Brand A is buying the most impressions, but brand B gets the most ad fixations. Brand B has the highest actual share of voice and thus a more efficient media strategy. 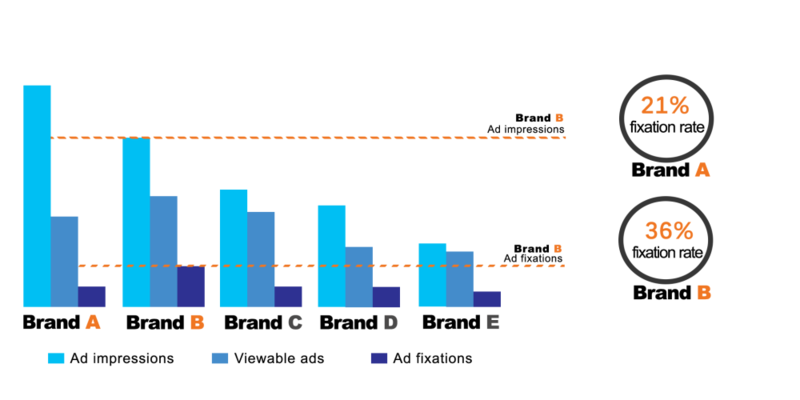 * Ad fixation rate is ad fixations divided by viewable ads. Data from October 2018. The attention economy isn't slowing down and the struggle to capture consumer attention is only getting harder. In order to effectively plan, evaluate and optimize your own digital campaigns, you need to understand what ads resonate most with consumers in the channels and sites where you spend your budget. We provide detailed campaign data on what channels, sites, ad spaces and formats perform the best. 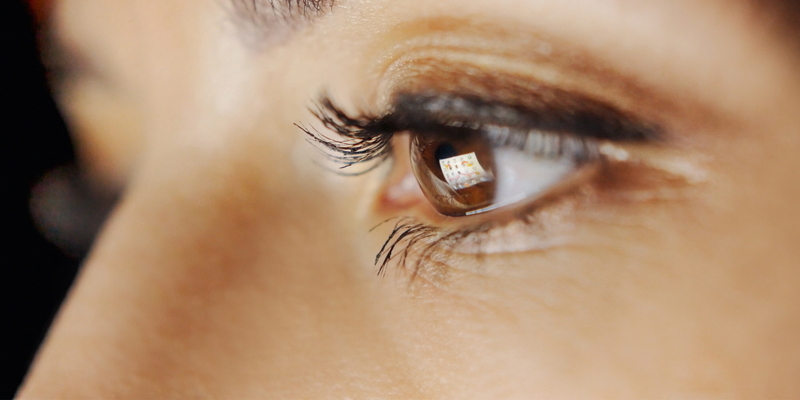 We've equipped 1,000 Swedish consumers with an eye tracker. Attached to a computer in their home, the device records panelists' gaze as they browse online content. Collected from users during their everyday digital media consumption, the data represents regular browser behavior across all channels and formats. All data is anonymized and aggregated so it cannot be tracked to a single panelist. The service is fully GDPR compliant. If you are interested in joining our panel, click here. As a client, you will be able to log in to a dashboard where you can view current ad fixation data across your ad placements as well as your competitors'. You can also view visualizations across a number of metrics.